Now that the candidate filing period has closed, there's a clearer picture of what's going on with House 48, the district I live in. The race has made some headlines as LaVar "Elect Democrats and the Terrorists Win" Christensen has sought to challenge incumbent Sylvia Andersen to get his old seat back after being thoroughly trounced by Jim Matheson in the race for Congress two years ago. It's also brought some other familiar faces out of the woodwork. 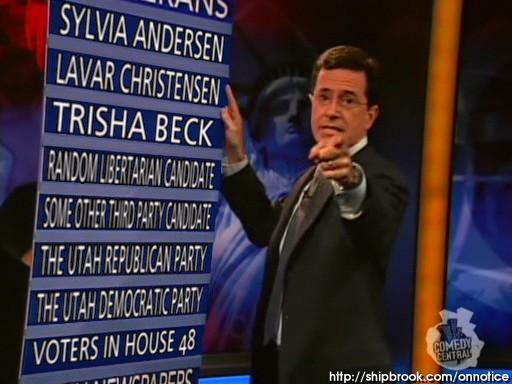 Democrat Trisha Beck, who ran for Senate 9 in 2006, has decided she wouldn't mind the job either. Not content to make it a three-way race, Leona Olds, a neighbor and friend from around the corner, has filed as the Constitution Party candidate in the race. (Her husband, Leonard, is making a go at County Mayor.) There certainly isn't a lack of candidates fielded for this seat. Beck already managed to get on my bad side by resorting to last-minute negative attack ads against her opponent. This isn't to say she may not be a good legislator, but I have my doubts when someone feels the need to tear others down in an attempt to lift themselves up. That might be why I don't much care for LaVar "Nancy Pelosi Will Destroy the Country" Christensen after he couldn't come up with any reason better to vote for him other than the R after his name. You see, I don't vote for someone as a way of voting against the other guy. Call it silly idealism, but I much prefer it to voting for someone as a means of voting against "the other guy". So what about Sylvia Andersen, the incumbent? She's failed to inspire me during her two years in office. She's certainly not as communicative with constituents as Sen. Neiderhauser has proven to be (mad props, Wayne) and it now seems silly to have castigated Eric Gustafson for being non-communicative when I've never gotten any kind of response to e-mails I've sent Andersen. I also think she's a little too willing to toe the party line. Yes, I voted for her in 2006 and even endorsed her campaign, but it now seems like a default choice than a real one. That leaves Leona Olds. Even though it's no secret that I have little love left for the Constitution Party, I'm not going to through the candidate out with the partisan bathwater. I suspect that I'd probably find her to be the most suitable candidate this time around, though it would feel a bit like deja vu from the last state-wide election. I don't like reducing things down to the least objectionable candidate instead of winnowing down to the best candidate. All of this is about enough to make me think about filing as an independent in 2010. Voters, you're On Notice. Looks like there's egg on my face. If Barr can survive the crowded nomination process (there were 15 seeking the Libertarian nomination last I checked), he may be able to pick up decent support in the South and some rural states. Not enough to carry electors, but certainly enough to make a splash and get some decent ballot access. It was actually Niederhauser who ran the last minute negative ad. He sent out a flyer that claimed that Trisha supported marijuana use. When she ran against LaVar there were reports of two men walking her district in black suits going door to door stating terrible lies about Trisha. You can have your opinion Jesse, but maybe you should consider the facts. What ended up in my mailbox was Trisha drawing first blood. If Wayne did send out a negative flyer with the content you describe, it never made it to my doorstep. Your information about Beck is batantly slanted buddy. Those criticisms are hardly negative, and you can’t pretend for a second that the Utah GOP and the Niederhauser campaign aren’t in cahoots. Oh, and $280,000 is hardly average. He’s practically set the record for spending. Mark: I’ve based all of my opinions on Beck on my own observations and hard evidence that I’ve seen with my own eyes. I’ve yet to see any proof, one way or the other, about any of the counterclaims. In the meantime, Beck is welcome to try and change my mind.